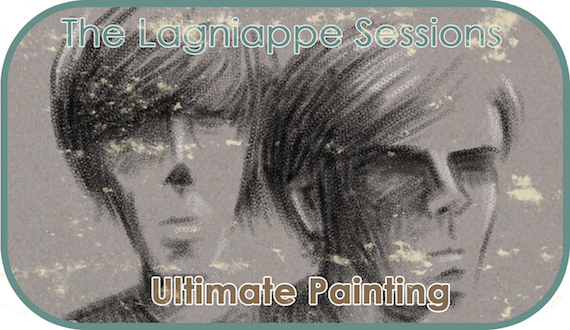 Ultimate Painting is the collaborative pairing of James Hoare (of Veronica Falls) and Jack Cooper (of Mazes). A beautifully languid pairing at that. This week’s installment of the Lagniappe Sessions finds the two taking on four disparate covers – from Fugazi and Times New Viking, to the ubiquitous 90s radio pop of Sheryl Crow and the Beatles. Ultimate Painting, in their own words, below. Huge fan of Times New Viking… for my money, one of the best bands of the last ten years. We stayed with Adam when we were just in Columbus and spent the drive there listening to TNV. We’d spent the previous evening in Cleveland where Jared lives now and it was great catching up with him too. Such a great band and the nicest people. This song is off their last LP… a super melodic chord whirlpool. I can’t remember why we chose this… It’s almost a talking blues. I always found it pretty exotic when I was a kid so when James mentioned it, I jumped in. We recorded all the music and then I realized just how weird her phrasing is. It wasn’t really possible to do justice to but I got myself in a different frame of mind and it went down fine. It’s a weird song and having since gotten into a YouTube wormhole, you realize she had some great songs… I suppose she got too big to do anything actually interesting again, but that’s another story. I used to drive around Devon listening to the Fugazi Instrument soundtrack when I was 17 with my friend Robin Christian, smoking in my mums Ford Fiesta. I’ve always had a lot of respect/time for Ian Mackaye and the way he runs his label and his general approach to music. You can learn a lot from him. The Instrument soundtrack features a wonderful collection of songs that I never tire of listening too. The Beatles are my favorite band, and George is my second favorite Beatle (after John) We learnt this for our recent US tour so we it made sense to include it here. The song’s were recorded in an afternoon in my bedroom. George’s guitar playing on this track is a nod to the Byrds and the influence clearly shows. Loving this record. These look great. I love the Fugazi and sheryl crow covers so much. I really wish they were also published elsewhere!